"The world’s lightest full-featured hooded down jacket. 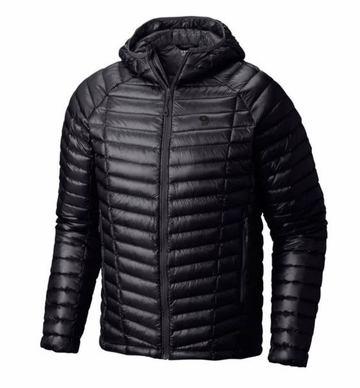 The sub-eight-ounce Ghost Whisperer Hooded Down can be compressed into its own pocket for easy storage. It’s been designed with the essentials in mind: Q.Shield DOWN 800-fill insulation resists moisture and maintains warmth, elastic stealth elastane binding inside cuff seals out moisture, toggle hem adjusts easily. Weight: 7.7 oz. / 219 g. "